Cardiff Devils Charles Linglet scored two goals against Sheffield Steelers. Pic: David Williams. Cardiff Devils’ strength in depth shone through during their 7-3 Elite League win against Sheffield Steelers at the Viola Arena. Captain Jake Morissette and his team were without three key players in Layne Ulmer, Joey Haddad and Evan Mosey, but powered to victory after scoring six unanswered goals in the second and third periods. “That depth is vital,” said head coach Andrew Lord. “We were able to ice 11 forwards and the guys really bought into the process. “Sam Duggan, Toms Rutkis, Matthew Myers, Mo, Matt Pope and more were grinding away for the team and allowed us to play at a tempo Sheffield could not match at times. “We have three guys out and that is challenging. To have two young bucks like Sam and Toms jump in and do a job was a major plus for the team. “The progress Toms has made is immense, while over the last four months Sam has improved so much as a professional ice hockey player. “They work day in, day out on their game and at times I’m sure they don’t like me very much and wish they had more ice time. “But they bide their time, are positive around the group. Mike Hedden celebrates his Cardiff Devils goal against Sheffield Steelers. Pic: David Williams. Ulmer has one match of his three-game suspension to serve, while Mosey is being monitored after the mid-ice hit by Jaynen Rissling which left him prostrate on the ice. Rissling was given a six-match ban, while Ulmer was suspended for three matches after leaving the bench to stand up for team-mate Mosey. Ulmer will miss next Saturday’s home fixture against Coventry before returning at Guildford Flames the following evening. Haddad is making progress and has been skating. He will be assessed again later this week. 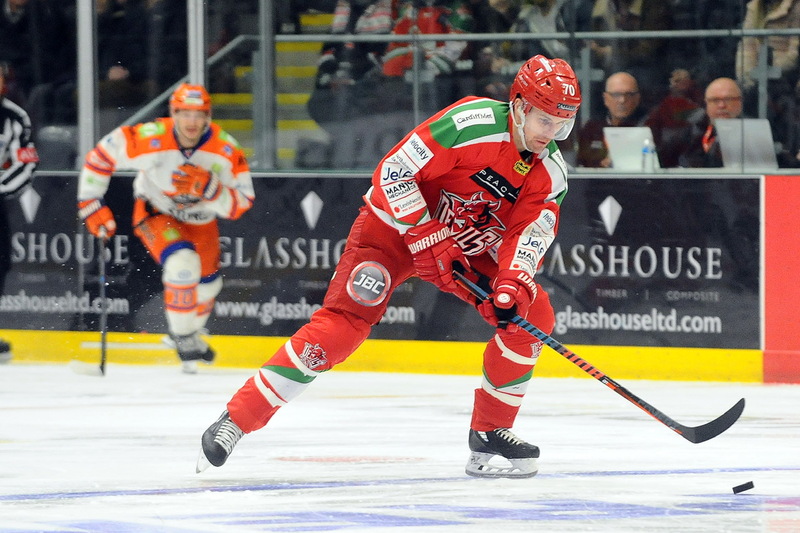 Cardiff’s next home test at the Viola Arena is against Coventry Blaze (Saturday, February 9, 7pm). Sean Bentivoglio against the boards. Pic: Helen Brabon.